Pretty incredible day. The flight to Lukla was fabulous. The views were stunning as we viewed the Himalayas in all their grandeur. So huge, it was just hard to comprehend. The twin prop engine flew so close to mountain tops I could see people. I almost thought if I waved, they’d wave back. The landing was what I’d expected..you see the landing gear go down, you feel the plane descend, but the ground is still not there. And then suddenly it is. 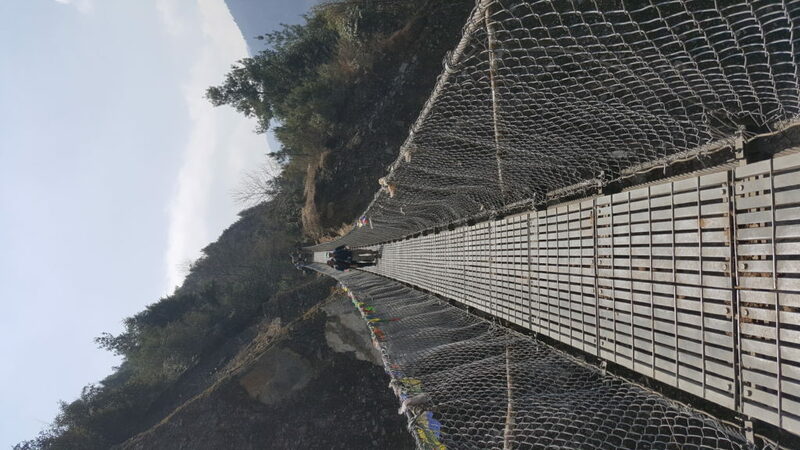 It is on a cliff in the Khumbu Region of Nepal. With giant mountains surrounding it. Just Wow. The start of our trek was thankfully easy, only 5 miles this first day. 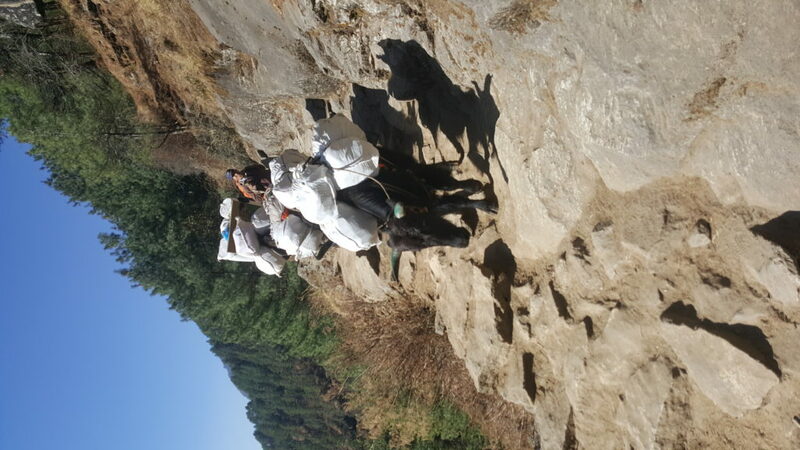 We pass lots of hikers (a few to Everest Base Camp but most on short hikes) and lots of sherpas as carrying supplies.. from rebar and metal siding to 12 cases of Everest Beer and lots of hiker gear. 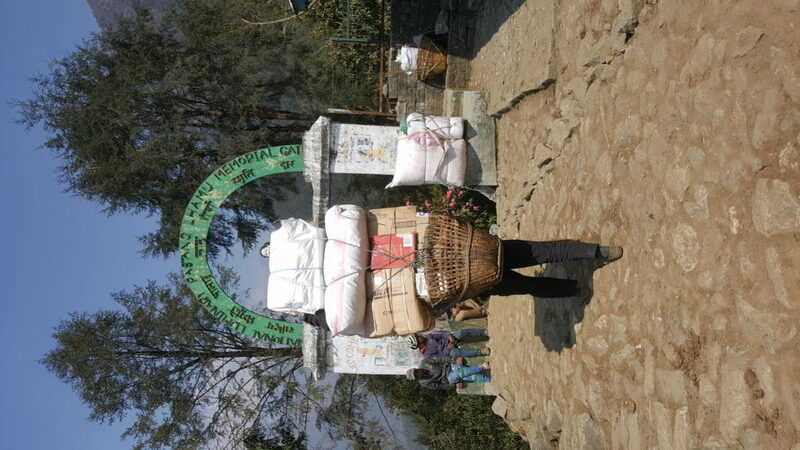 The loads they carry are nothing short of astonishing. We are more than grateful for our porter and plan to tip him well at trip’s end. There are also tons of locals moving their own herds up and down the trails with cows, yak, horses and donkeys. It is a very busy place! The Himalayas are sprinkled everywhere with “tea houses,” which are lodges for people on climbs. Some are pretty bare bones, others have en suite bathrooms and hot showers. None have heat, which is why I am lying on my bunk wearing 3 layers and it’s not even nighttime and cold yet. Tonight is at a middle of the road tea house. We have a bathroom but no hot shower. With no hot water I decided to wash up early but still the water made my hands numb. I cannot imagine what it will be like in a week. On Kilimanjaro I wore 8 layers to bed. I’m thinking I might break that record this trip. Our guide, Assis, gave us the rundown of what we should and shouldn’t eat. It’s mostly everything on the NO list, especially as we get higher up in elevation. No reason to risk food poisoning. Foreigners are especially susceptible. Much will have curry, he says, which i can’t eat. Thanks to our friends who’d come here before us, I knew to bring 10 plus pounds (!) of fancy gorp, dried fruit and disgusting jerkey, which I’ll eat for the protein even though I’m not a fan. I actually sacrificed some extra comfort clothes to make sure I could take food just in case! So far, though, I’m fine with veggie noodles or veggie rice but that will get old fast. It’s 3:50 in the afternoon. We are resting in our room and my fingers are freezing…yet it was warm enough to hike in a t-shirt earlier. This is going to be a long trip.